The UK is to establish the largest, continuous marine reserve in the world, around the Pitcairn Islands. The Pacific zone will cover 834,000 sq km (322,000 sq miles) - more than twice the land area of the British Isles. The intention is to protect the wealth of ocean life from illegal fishing activities. A satellite "watchroom" has been established to monitor vessel activity, and to gather the information needed to prosecute unauthorised trawling. The announcement of the reserve came in Chancellor George Osborne's pre-election Budget. The Pew Charitable Trusts and the National Geographic Society, who campaign on the need for marine reserves, welcomed the news. NatGeo explorer and TV presenter Paul Rose told BBC News: "Ocean leadership like this from our government is exactly right. It protects the pristine waters of our overseas territories and sets an example to the rest of the world, giving hope and encouragement to future generations. Thank you UK government." The UK already had the largest continuous, fully protected marine reserve in the world - around the Chagos Islands in the Indian Ocean. This area, established in 2010, is 640,000 sq km in size. (The US Pacific Remote Islands Marine National Monument is larger at 1.2 million sq km but is not continuous). Conservationists believe such zones are an essential component in the toolbox of measures required to tackle the colossal trade in "dark fish". It is thought as many as one in five fish are landed outside of national or international regulations. The value of this trade could exceed more than $20bn (£13bn; 17bn euros) a year, according to some estimates. Much of the theft is perpetrated by industrial-scale pirate operations that think the vast expanse of the oceans can hide their behaviour. Some of the confidence to establish reserves leans on new satellite technologies that are able now to track and follow the pirates. This is being done in the new watchroom, established at the Satellite Applications Catapult in Harwell, Oxfordshire. It is a partnership between the Catapult and Pew, and is called Project Eyes on the Seas. Its smart systems not only track vessels but analyse their movements. And by incorporating additional data, such as sea conditions and probable fish locations, Project Eyes can make predictions about what the vessels are likely to be doing. Algorithms provide automated alerts. In conjunction with the Pitcairn designation, The Swiss-based Bertarelli Foundation has agreed to HELP fund the watchroom to support the designation of the Pitcairn reserve for the next five years. Project Eyes, which has been in a demonstration phase until now, is ready go into full operation and it could be used to provide support for other reserves as well. Jo Royle, who manages Pew's Global Ocean Legacy campaign in the UK, said: "There is talk from the UK government that they will now designate Ascension Island. They're talking to islanders to understand their marine resource needs. "We're also trying to get South Sandwich Islands designated as well. And this year could be a big year because Chile are talking about designating Easter Island, and Palau are talking about designating the waters around themselves. The issue is rising up the political agenda." The Pitcairns are one of the most remote island groups in the world. The British Overseas Territory comprises four islands - Pitcairn itself, Henderson, Oeno and Ducie. 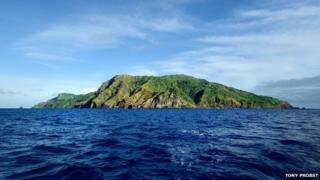 Pitcairn is the main island with a population of about 60 people. Famously, most of the inhabitants are descended from crewmembers of the mutinous British Royal Navy's Bounty ship, who settled the area with their Tahitian companions in 1790. A survey of the waters around the islands shows they are not particularly productive in terms of the high-value pelagic species. Tuna fishing, for example, takes place well to the north. But there is concern that if illegal operations do move into the immediate waters around the Pitcairns, they could decimate the marine life that does exist there very rapidly. The waters' main claim to special status is really their pristine nature. The range of species that occupy the complex community of hard and soft corals is impressive. These include two species found nowhere else on Earth: a species of squirrelfish and the many-spined butterfly fish. Also, the area is home to many important bird species, such as the Henderson petrel (endangered), whose only known breeding spot in the world is on Henderson Island. The UK government said it would proceed with the designation of Pitcairn on the basis that all the satellite monitoring arrangements are put properly in place, and that any naval costs can be accommodated within existing departmental expenditure limits.